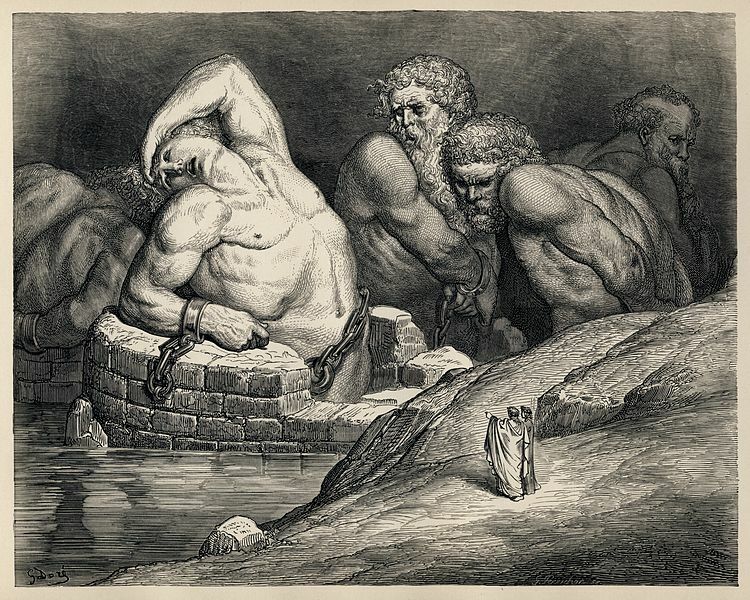 The Aloadae is the collective name for two giants in Greek mythology, the giants being the brothers Otus and Ephialtes. The Aloadae would prove to be a threat to the gods of Mount Olympus, and ultimately to deal with the threat, Zeus would imprison the two giants in Tartarus. Otus and Ephialtes were called the Aloadae to identify them as the sons of Aloeus, but whilst the pair were the sons of Aloeus’ wife Iphimedea, they were sons of Poseidon. Iphimedea was in love with Poseidon and would often walk down to the coast, wading into the sea, and collecting the sea’s waters in her lap. The water held in her lap would see her fall pregnant. The two sons born to Iphimedea were no ordinary sons for they were gigantic in stature, and by the time that the pair were nine years of age, it was said that they were 27 cubits tall (30 foot plus) and 9 cubits wide (10 foot plus), and growing at a rate of 3 cubits in height, and one in width, every year. The names given to the Aloadae are generally translated as Otus, meaning Doom, and Ephialtes, meaning Nightmare, but despite the dark names, the Aloadae were considered to be amongst the most beautiful of men. The youthful Aloadae were perceived in a heroic light, and whilst still very young, the Aloadae would rescue Iphimedea, and their step-sister Pancratis, from Thracian pirates; for the two women had been abducted from Mount Drius as they partook in the Dionysian orgies. ​The Aloadae would catch up to the Thracian pirates upon the island of Naxos and there the giants would kill those who had foolishly abducted Iphimedea. Some say that the Aloadae would subsequently rule over Naxos, but the towns of Aloium in Thessaly, and Ascra in Boeotia were also said to have been founded by the pair of brothers. Additionally it was also said that the Aloadae were the first to worship the Muses upon Mount Helicon. The downfall of the Aloadae would occur whilst still young though, although two versions of this downfall are given in Ancient texts. It was said that the Aloadae attempted to storm the home of the gods, threatening the rule of Zeus in the process. The Aloadae piled Mount Ossa upon Mount Olympus and then stacked Mount Pelion on top, and so the palaces of the gods were now almost in reach. Before Otus and Ephialtes could commit the final step to storming the home of the gods, Apollo took up his bow and shot dead the two giants. Then Zeus used his lightning bolts to separate the mountains again. It was said that if the Aloadae had waited until they were older, and hence even more gigantic in stature, then the pair might have succeeded. Now the attempt to storm the home of the gods might not have been an attempt to overthrow Zeus, but was perhaps an attempt to make the goddesses Artemis and Hera wives of the two giants, Otus desiring Artemis, and Ephialtes Hera. The possibility of marriage also appears in a different story of the downfall of the Aloadae. Otus and Ephialtes managed at one point to capture the god Ares, and the Greek god was subsequently imprisoned by the Aloadae inside a bronze urn upon the island of Naxos. The other gods were unaware of what had happened to Ares and the months passed until a lunar year had almost elapsed; and it was thought if 13 months had gone by then that would have been the end of Ares. As that point approached though, Eriboea, the stepmother of the Aloadae, told Hermes about the fate of Ares. Some tell of how Hermes released Ares, but others say that it was Artemis who came to ask for the release of Ares, and promised herself to Otus if they did so. Artemis’ words though caused Otus and Ephilates to argue, for of course Ephilates was now jealous of his brother. As the pair argued, Artemis changed herself into a stag, and fearing that the goddess was going to leave them both, the Aloadae threw their spears. The spears of course missed the stag, but found their mark in the two brothers, killing them. Now it was said that the tomb of the Aloadae was to be found in the town of Anthedon in Boeotia, but it was also famous said that Otus and Ephilates were punished in Tartarus for their presumption, either to threaten the rule of Zeus, or because the sought to take an Olympian goddess as their wife. Thus, the Aloadae were bound to pillars in Tartarus by snakes in such a way that brother could not look upon brother, and the giants were watched over by an owl that would torment the pair with its shrieks.